Map of North Greenland with shallow (red/yellow) and deep (blue) oceans. 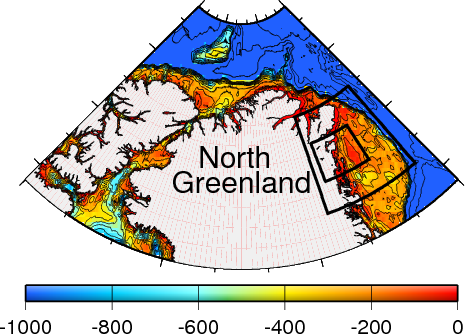 Future study area are black boxes on the continental shelf of north-east Greenland. Small box is the area shown via MODIS imagery below. 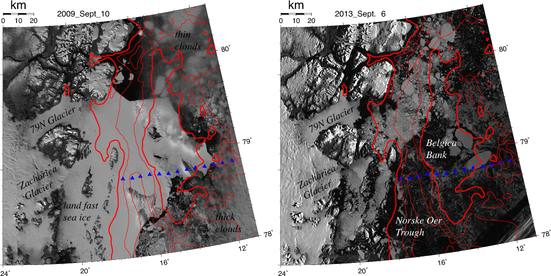 Anotated MODIS images of 79N Glacier and Zachariae Icestream in September 2009 (left) and 2013 (right). Thick red line is 100-m depth, thin red lines 200 and 300-m depth. Icebergs often ground on Belgica Bank (<100- deep) supporting extensive land-fast ice such as in 2009 but not 2013. To do this, I need about 7000 pounds of equipment to get from western Canada to northern Greenland. All this stuff sits in the Port of Montreal (Canada) waiting for the freighter “Montreal Express” to ship it all to Hamburg and Bremerhaven to be loaded onto the R/V Polarstern, AWI’s research icebreaker. All ships are tracked via https://www.marinetraffic.com/en/ in real time and, I just checked, she just left Hamburg for Montreal this morning. Radar data from satellite on Mar.-14, 2014 off north-east Greenland with a few ice motion vectors. Norways StatOil lease area on the continental shelf off north-east Greenland just to the south-east of Belgica Bank, taken from their Dec.-20, 2013 press release. There is much more to explore and think about here, but this will have to await a future blog when my mind is less cluttered by ship and travel schedules, paper and proposal writing, data and computer chasing, or just keeping a crazy life of working across 9 time zones together. Scientific life is good and fun, but exhausting and nerve-wrecking at times. This entry was posted in Greenland, Ice Cover, Norway and tagged Arctic Ocean, continental shelves, exploration, Greenland, iceberg, radar. Bookmark the permalink. I do not understand how the polar science community can still, in 2014, be sponsored by the oil and gas industry. The scientific community is NOT a monolithic block sponsored by one government agency, country, or industry. Scientists are also citizen who frequently debate data, approaches, and policies from diverse sets of values and philosophies sometimes even within the same person or family of friends. All my funding comes from the National Science Foundation and the University of Delaware. The current project to deploy ocean current moorings off Greenland expends about $179,000 of US federal funds. It pays one month of my salary this summer, about $11,000 pre-tax. The Unversity of Delaware pays me for 9-month each year to teach students, conduct research, and provide service to a larger community. I currently have no other sources of funding or income.